A type of honey produced by stingless bees in Malaysia shows some protective effects against induced gastric ulcer in rats. Selangor, Malaysia, Aug 1, 2018 - (ACN Newswire) - Induced stomach ulcer (gastric ulcer) was smaller and less invasive in rats that regularly consumed a type of honey produced by a stingless bee in Malaysia. The study, published in the Pertanika Journal of Science & Technology, indicates that kelulut honey could be further investigated for potential anti-ulcer properties. The internal lining of the digestive tract can become susceptible to the development of ulcers when it is exposed to excessively acidic content. This can happen as a result of smoking, nutritional deficiencies, prolonged treatment with non-steroidal anti-inflammatory drugs, or infection with a common stomach bacterium called Helicobacter pylori. Commonly used anti-ulcer treatments can cause side effects, so researchers at Universiti Putra Malaysia, led by Associate Professor Latifah Saiful Yazan, investigated whether the antioxidants in kelulut honey could provide protection against stomach ulcer development. The team placed 18 rats into three different treatment groups. One group was reared normally as a control. One of the two test groups was fed one tablespoon of kelulut honey twice daily for 30 days. At the end of the month, both test groups were fed ethanol to induce stomach ulcers, and then euthanized 15 minutes later. The researchers studied the rats' stomach linings with the naked eye and under a microscope. They found that, although ulcers developed in the stomach of both test groups, the ones in the rats that regularly consumed kelulut honey were smaller and less invasive. "The anti-ulcer properties of kelulut honey are believed to be due to its high antioxidant properties," the researchers write in their study. However, further research would be required to determine if there are similar benefits for humans. 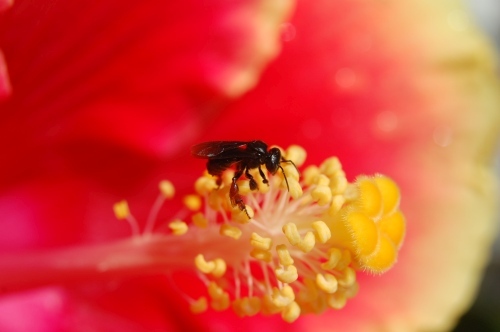 Kelulut honey is produced by a stingless bee from the Trigona species. It has an intense colour due to the presence of two types of natural antioxidants: carotenoids and flavonoids. It also has a high phenolic content, which is considered a reliable indicator of antioxidant activity. Antioxidants could help protect against the development of ulcers due to their role in tissue growth and repair, and by activating the immune system to fight against bacterial infection. In Malaysia, kelulut honey is often consumed to help with coughs, colds, to accelerate healing of internal injuries, and to delay aging.